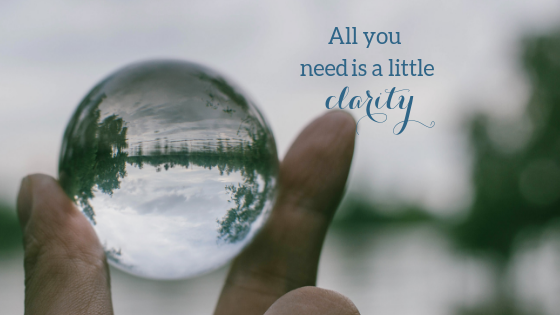 11 Apr What if all you need is a little clarity? Once upon a time a sales coach told me “people won’t buy clarity”. I’m willing to bet you’ve invested a ton searching for clarity. A ton of time, a ton of energy and yes, a ton of money trying to find that knowing, that direction, those right words, so that you can talk and write about your business with confidence and people will finally ‘get’ what you do. Maybe you invested a whole lot of moolah in a fancy pants branding package, only to find that the brand you’ve created reflects what you think you ‘should’ be doing, or who you used to be – not what’s truly in your heart. Maybe you’re constantly distracted by shiny objects. The next course you need to take, the new coaching programme you need to try, the Facebook ads programme you need to master… so you sign up while knowing deep down you will never get around to implementing it. Maybe you’re constantly creating new products or workshop, with the intention this will be your ‘thing’, yet never allowing it to be good enough. There’s always a reason to tweak it, to rerecord that video, to make another module, to redo the workbook… And so you recreate and recreate instead of making the most what you’ve already done. And yes… I may be speaking from experience here. Not just my own experience, but that of dozens of my clients who’ve been down the path before you. Endlessly pursuing that clarity, that direction, that will allow your business to fly. And you know what you really need to find? A clear, consistent, compelling message that will stop your people mid-scroll and engage their hearts and minds. A message that will set you apart and help your readers understand why they should do business with you (or not – which is just as useful information). A message that will inform all your planning, projects, offers and content for the coming year. Because if it doesn’t jive with your message, why are you wasting your time? A new season is upon us, so I invite you to make a commitment to yourself AND your business, that 2019 is the year you will finally get your message sorted. To get there, you’re going to need to do a little digging. 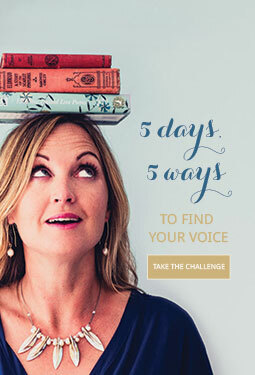 That’s why I’m so excited to be hosting the Illuminate Sessions – five days of mini workshops to help you dig deep into your message and share with impact. Everything you need to know is already within you. Simply enter your name and email below to join the Illuminate Sessions and let’s find your clarity at last. We start Monday 29 April.